← In the Name of Your King! Reaction: After the challenges phase begins, choose a player. That player may give you 1 gold from his or her gold pool. Until the end of the phase, if that player has not given you gold this phase, he or she cannot initiate challenges against you. The Road to Winterfell #29. The chosen player has the option to give you gold (immediately, when triggered, not whenever they want). It forbids the chosen player from initiating a military challenge against you unless they have paid you (for any reason!) during this phase. 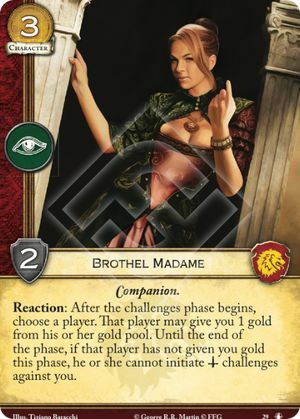 Note that another card, Paid Off, also allows a player to give you gold, and gold given for another effect will satisfy the Brothel Madame. Also, paying one Brothel Madame will satisfy each Brothel Madame if a player controls more than one (so they don't stack).